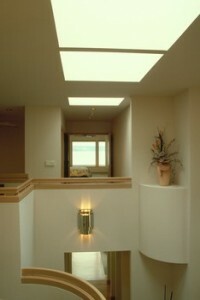 Skylights are quickly gaining in popularity. There are many reasons to add a skylight to your home, such as brightening up a room, making a room appear larger, decreasing your energy bills, living a greener lifestyle or simply to help keep plants alive. Truth be told, skylights can save huge amounts of energy. Let’s say your kitchen doesn’t have a nifty window over the sink: you can’t see what you look like in the mornings under the fluorescent bathroom lighting. Your foyer is gloomy. You trip down your dark staircase. You feel your way down a hallway. Skylights are said to naturally increase the amount of light in a room by 30 percent! There are lots of convenient places for a skylight, especially in old houses that don’t display high ceilings and tall, modern windows. They can also be very stylish and sleek. When it comes down to it, nothing compares to the value of natural sunshine. There are three types of skylights. A fixed skylight is a pane of glass that only allows light in. It never opens and it’s insulated well to keep cold and hot air from entering the home. A ventilating skylight may be opened to allow air through, like a window. They can be opened by remotes, electric switches, temperature sensors or simply hand cranks. Lastly, a tubular skylight is a newer model. An optical, clear plastic dome peaks out of the roof and collects the light. It then sends the light down a metal tube that is coated with reflective material. This light passes through the ceiling or attic and into the interior ceiling through a diffuser. The diffuser helps to make sure that light is spread evenly throughout a room. Overall, tubular skylights are cheaper and save the most energy. Because it isn’t just glass separating the outdoors to the indoors, the insulation is better. And because it is shaped like a dome, light scatters evenly around an entire room for the entire time that the sun is visible. Fixed skylights come in every shape and size imaginable and can add a chic design to a room. If you’re going for decoration and appeal, these are your best bet. Ventilating skylights work best in bathrooms or kitchens, where you need to keep air circulated. Are you afraid of a skylight making a room overly bright and fading your interior décor? This no longer needs to be a worry. Skylights can now feature shades, blinds and dimmer switches. Some have automatic timers for when to dim or when to open. Tubular skylights can feature different diffusers, such as clear, frosted or brushed linen. In conclusion, skylights have come along way. Your roof determines part of the installation process. The simplest way to find the right skylight is to find one that will fit between your roof joists. Otherwise, installation will require reinforcing. Also, find out the thickness of your roof. That determines the amount of mounting and flashing required. Your ceiling determines the other half of the installation process. What type of ceiling you have decides whether or not you will need a shaft. A regular ceiling needs a shaft, whereas a cathedral ceiling can mount a skylight right to the roof. You can install skylights yourself, but make sure you have background or experience with basic carpentry, and you must feel comfortably working on the roof. Some hardware stores will install your skylight as a service to you. Once you decide to add a skylight, enjoy researching your endless possibilities!